Determines if the object inside the image is a registration mark or not. This method is available in the Document/Medical Toolkits. RasterImage object that references the image to be searched for registration mark. Value that specifies the type of registration mark for which to look. Currently, only one registration mark is defined (T-shape). See the Comments for more information. More shapes will be added in the future. Minimum scaling factor of mark to be detected. This is a percentage. It must not exceed maxScale, or an error will be returned. This parameter accepts only positive values. Maximum scaling factor of mark to be detected. This is a percentage. It must not be lower than minScale, or an error will be returned. This parameter accepts only positive values. The width of the registration mark (in pixels). This parameter accepts only positive values. The height of the registration mark (in pixels). This parameter accepts only positive values. Boolean value indicating weather that specific object is registration mark or not. This method verifies whether the object inside the image is a registration mark. The object must be white and the background be black. Objects that are not white will not be detected. The image must have only one object inside it in order to work properly. 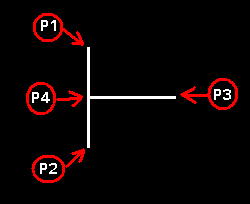 Currently, there is only one type defined, a T-shaped figure as shown in the following figure. This type is a "T" rotated by 90 degrees counter clockwise. The P4 point must be on the center point of Line P1P2 (that is, the distance from P1 to P4 equals the distance from P2 to P4). The line width should be greater than 2 pixels(preferably 3 pixels). There are no conditions on line lengths since you provide the values for width, height, maxScale, and minScale. Do not use this command to search for registration marks inside the image. Use SearchRegistrationMarksCommand instead. This example determines if the object is a registration mark.